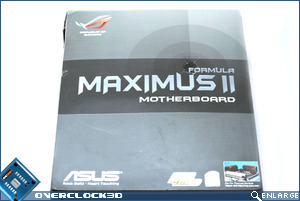 The exterior of the box is typical of past Republic Of Gamers boards, being matte-grey in appearance with an embossed Maximus II emblazoned in chrome effect across the middle. 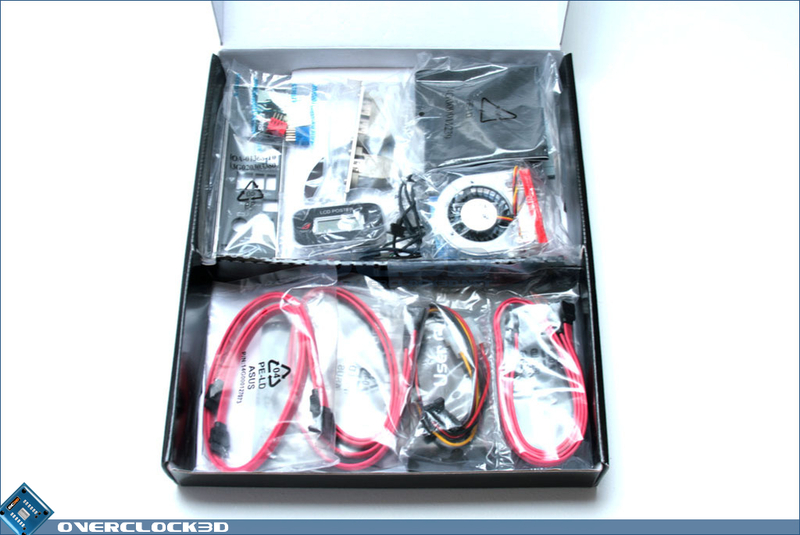 With a convenient carry handle and stiff cardboard surround, the box itself is a very sturdy piece and should protect the contents well. 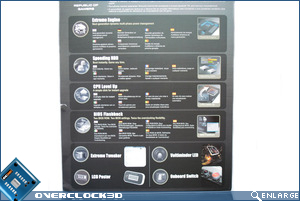 The rear of the box gives a brief run-down of the features on this motherboard, with performance and overclocking uppermost in the advertising echelon. 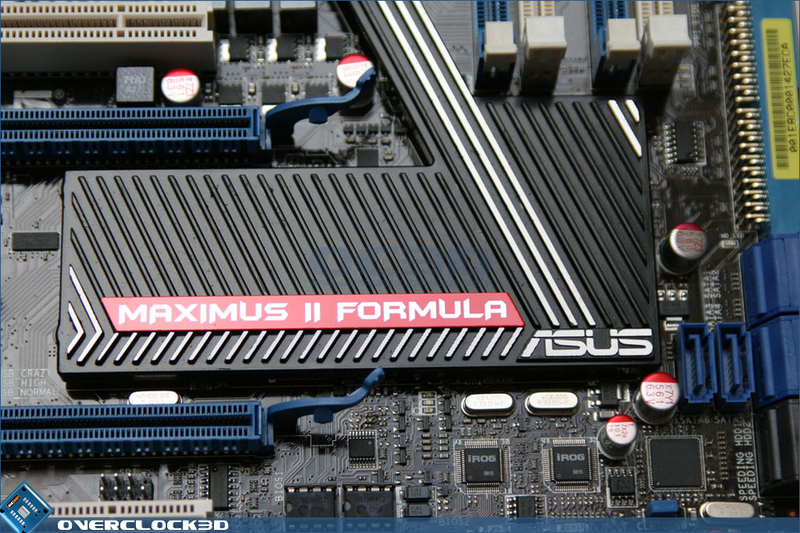 Opening the lid, which is fastened via a Velcro strip, we see a more in depth run-down of the Maximus' more prominent features, once more with performance and reliability featuring high on the list. 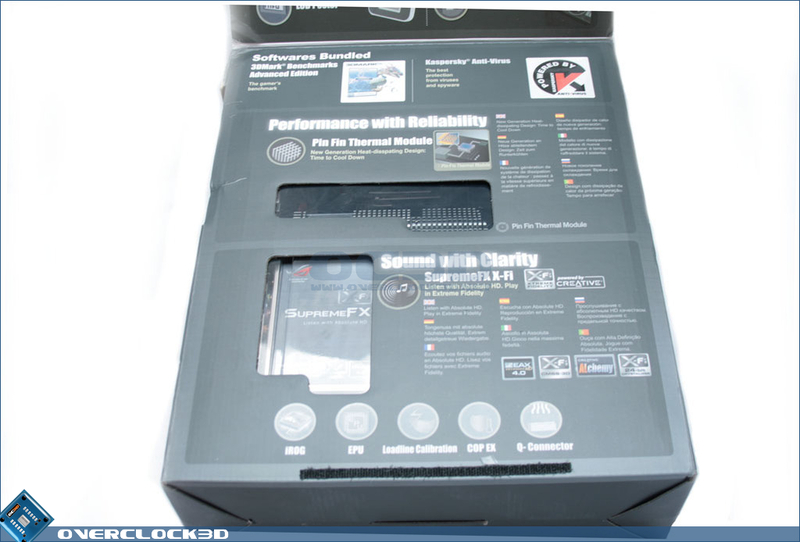 The bottom section of the inner box features a cut-out section allowing you to see the 'revolutionary' pin-fin heat sink as well as showing off the included X-FI SupremeFX sound card. 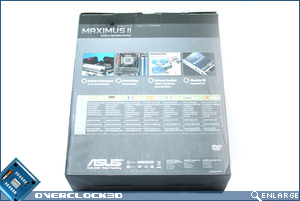 Inside the outer box we find yet another box and the motherboard itself. 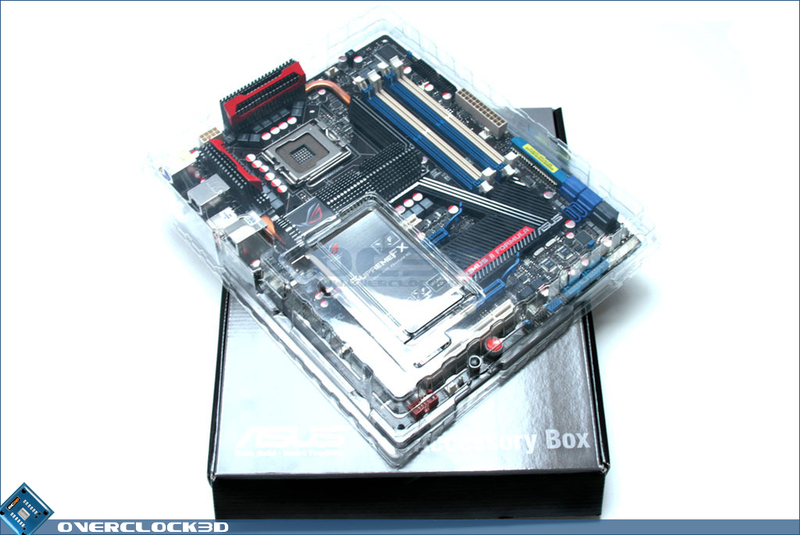 The motherboard is encapsulated inside a plastic casing which serves to protect the board from both physical damage and static charge. 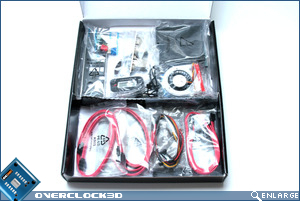 The additional box is where we will find the motherboard accessories, and once again the box is adequate enough to prevent any accidental damage to the gadgetry held inside. 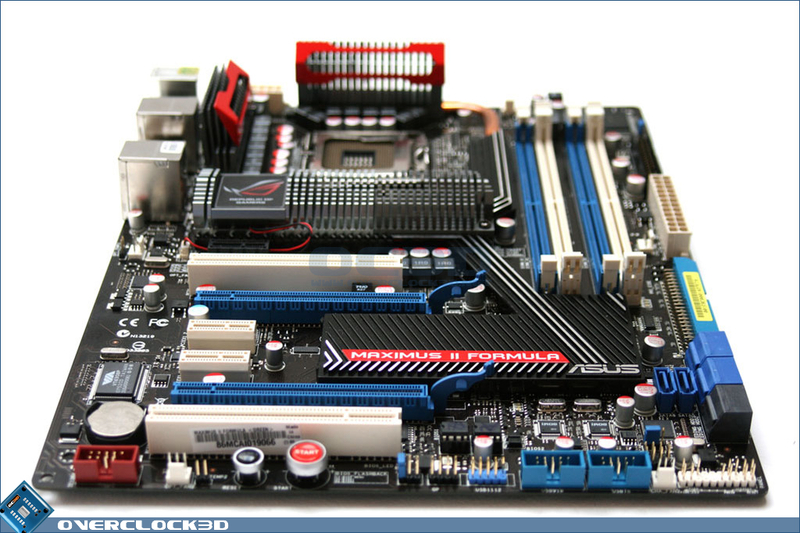 The contents themselves are now commonplace among the ROG series of boards, with the usual SATA and IDE/Floppy ribbon cables. Personally, I would like to see rounded cables now rather than the dated ribbon type, but as the IDE interface is slowly being fazed out it is not so much of an issue. 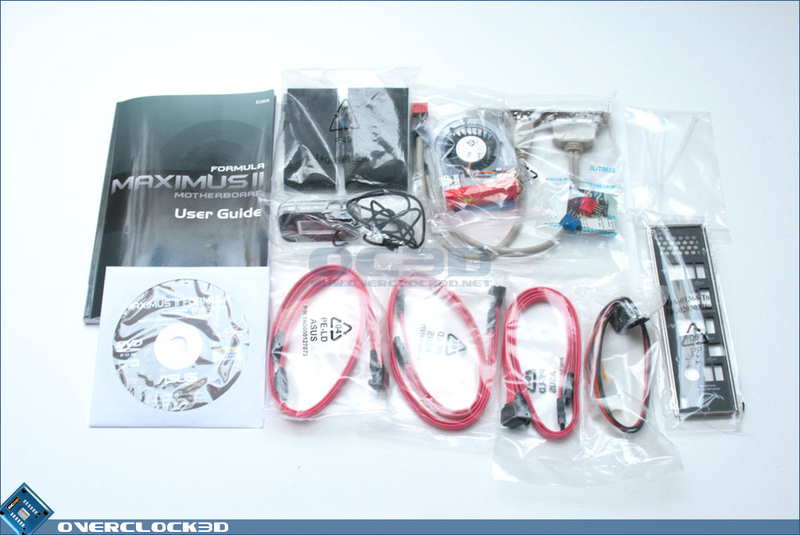 An optional fan is included for those who wish to watercool and a spare USB bracket is also included just in case the onboard 8 are not enough! 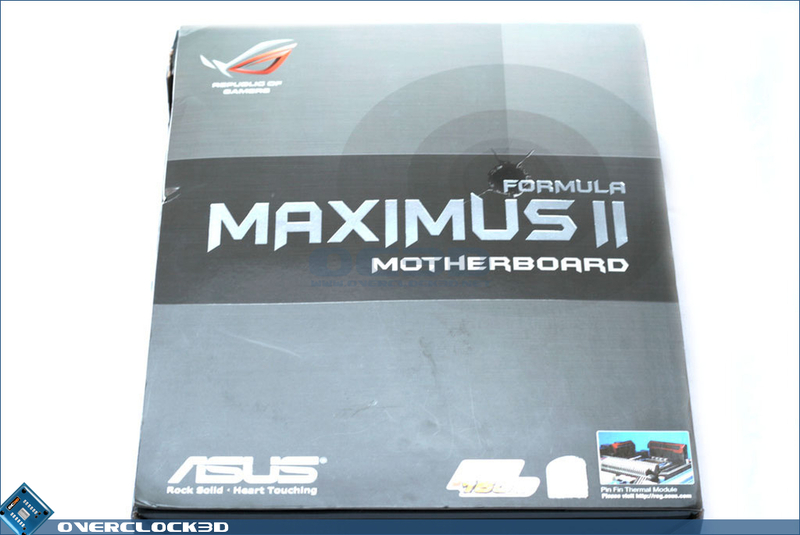 We also find that Asus has included a Q-Shield, which is not your average I/O backplate. 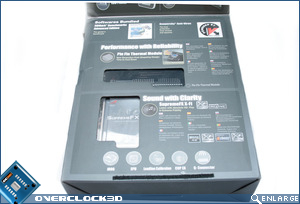 The Q-shield has a padded feel to it with no sharp edges and well labeled port slots. 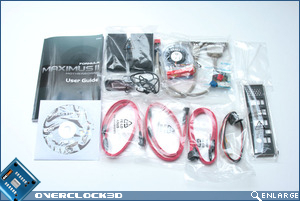 With the very thorough and well featured motherboard manual in plain English (not 'Chinglish') and motherboard DVD featuring both drivers and all the utilities you could want, this completes a well packed accessory box providing everything you need to get you started. 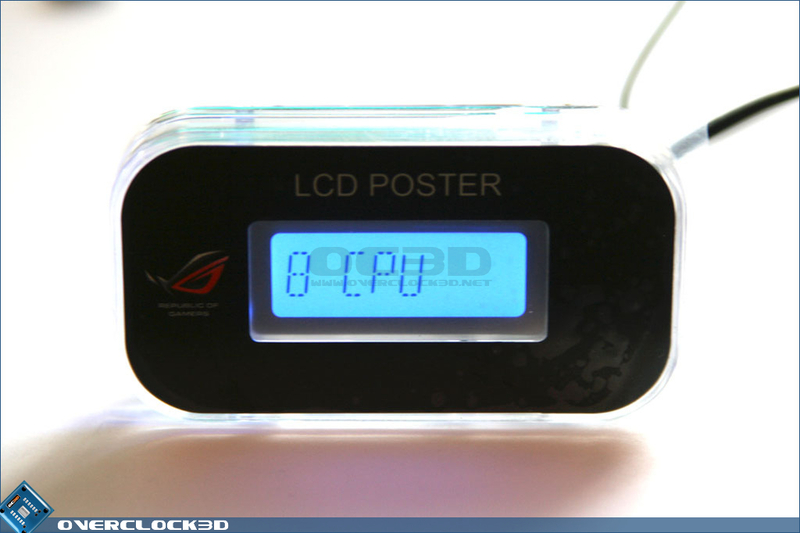 Although seen previously on ROG board, the Maximus Formula has the luxury of a new version of the LCD poster, which can cycle through key voltages and temperatures during a Windows session rather than just a clock (which is still an option if you so wish). 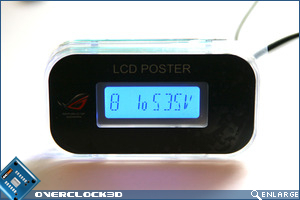 This is very useful for monitoring true voltages, or at least what the motherboard interprets as true rather than making use of software-based monitoring applications. 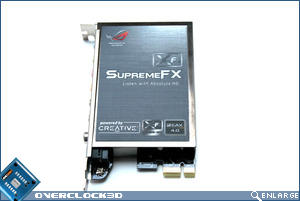 The jewel in the Maximus' crown, however, is the inclusion of the new SupremeFX X-FI riser card. 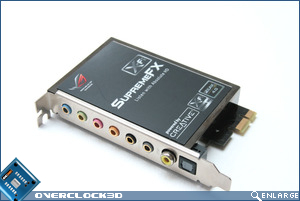 As the name suggests, this soundcard is based around Creative's X-FI chipset, which is a strange move by Asus considering that they have their very own chipset now and one would have thought this would have been preferred to the 'Creative' alternative - maybe Asus see the X-FI as a budget chipset compared to their own Xonar? Either way, it is a welcome addition and should provide some serious sounds - much more so than the usual drivel spouted from onboard audio of past. 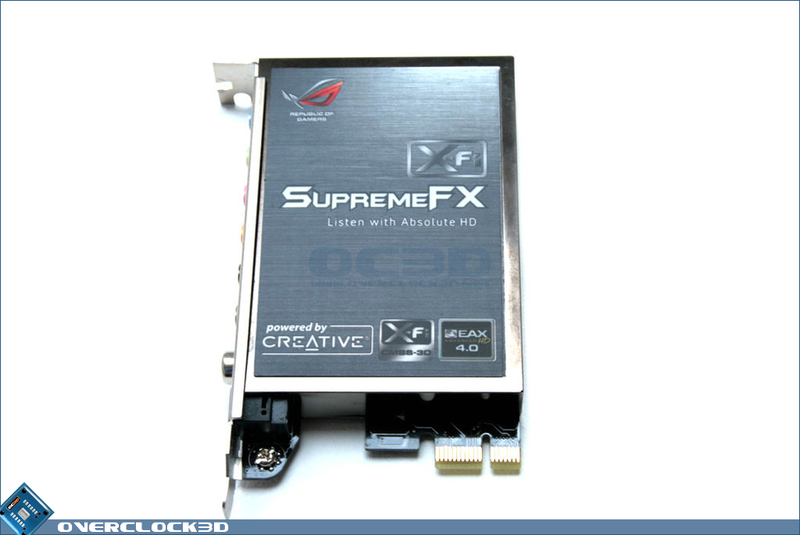 Interestingly, the card is not a full blown X-FI card as it is based on Creative's new SoundBlaster X-Fi MB technology, which utilises Analog Devices' AD2000B Codec. 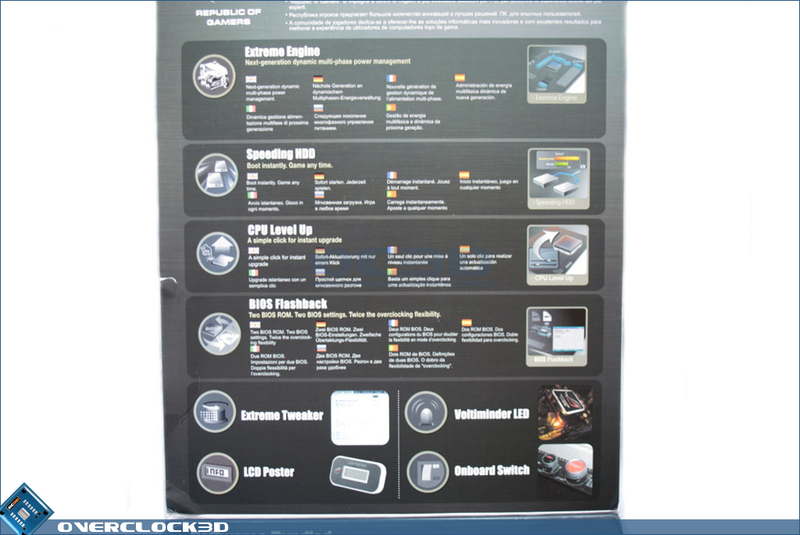 The actual effects are largely software-based, emulating the majority of a dedicated X-FI card's functionality. 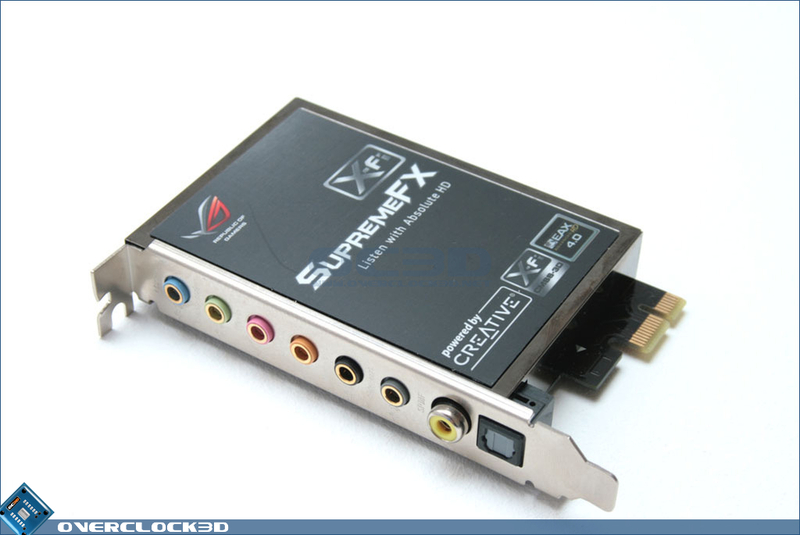 The card itself has CMSS, X-FI Crystalizer and support for up to EAX 4.0 - note no inclusion of EAX 5.0 support. For that you will have to purchase a dedicated X-FI or Xonar card! 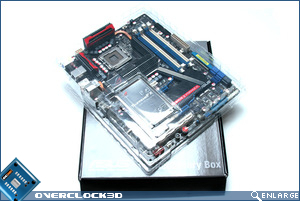 The motherboard itself could easily find itself presented in a display cabinet. Looking more like a Cylon from Battlestar Galactica than a Roman Gladiator, the dominating feature is the heatsink assembly. 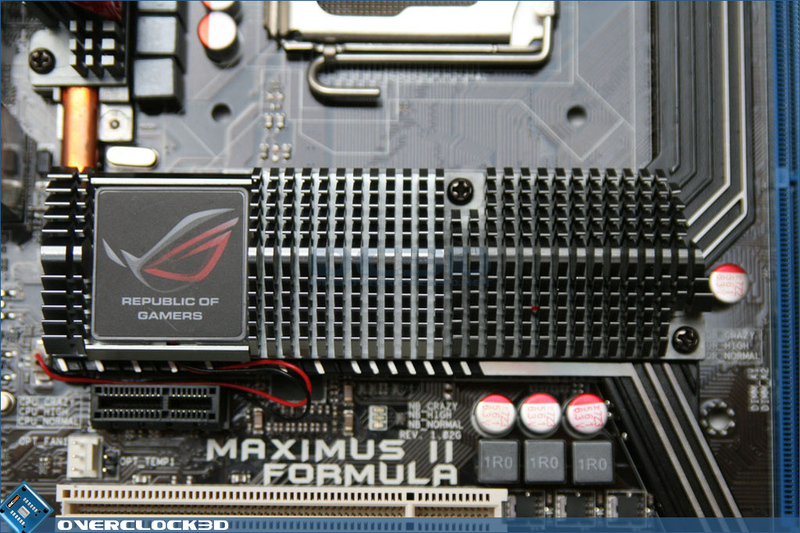 Connecting all the major heat sources via copper heat pipe, the heat sink assembly certainly looks the part with aluminum 'pin-fin' sinks coloured gunmetal grey and a little ROG emblem lighting up once powered. 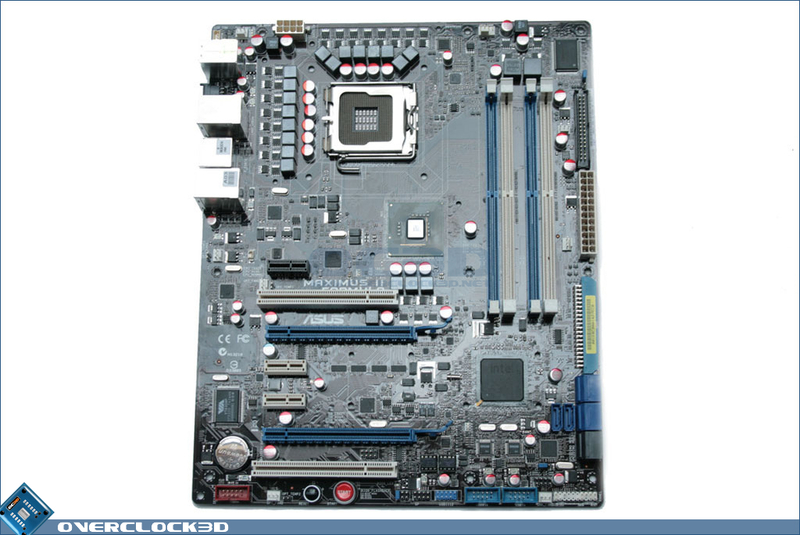 At the rear of the board, we see that the heat sinks are attached this time with spring loaded screws rather than the usual plastic push pins. 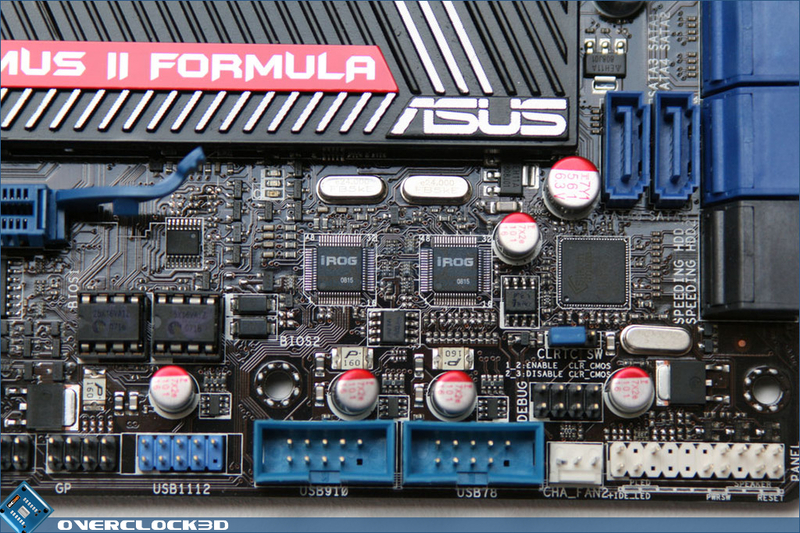 This is an excellent move by Asus, as it should create much better mounts of the sinks in general with adequate pressure applied and of course allowing user to attach water block with relative ease should they wish. 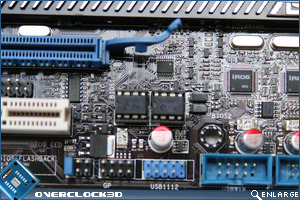 Of notable absence are backplates to the mosfet and chipset sinks as seen in the P5Q Deluxe board, which is a shame not to have this feature on the more expensive Maximus II. With that said, there didn't appear to be any excessive warping of the board. 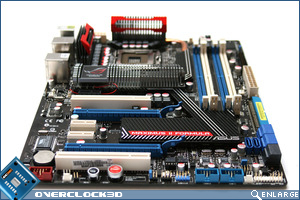 The board is typical of ROG boards of late and follows the ROG theme of previous motherboards with blue and white RAM and PCI/PCIe slots based on a black PCB. All of the connectivity is positioned around the perimeter of the board, which makes for a very tidy setup for those who like a clutter free cabling operation. 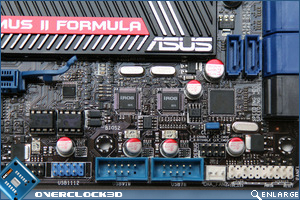 24/8 pin PSU's are now standard among high end Asus boards, so don't expect to be using 300w generic PSU's with this board. 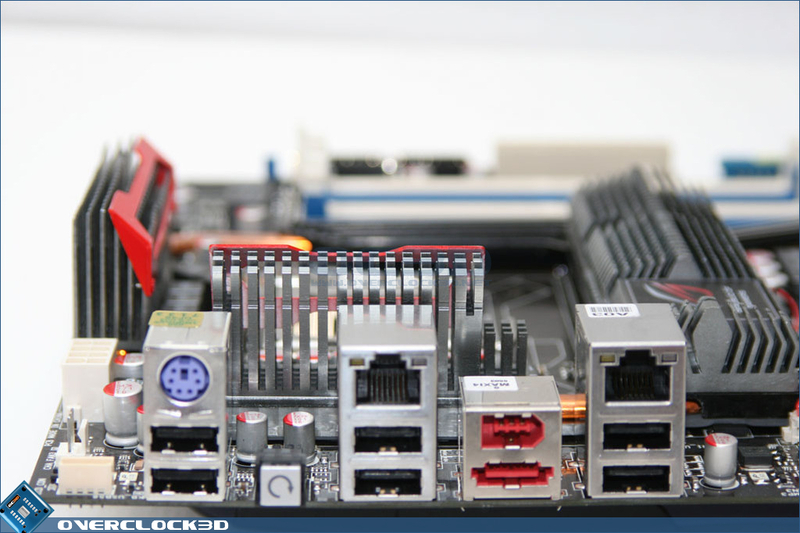 The I/O backplate area is fully featured with 6 USB 2.0 ports, dual Gigabit Ethernet ports, E-SATA and Firewire. 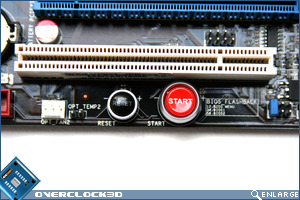 Notable by its absence is a PS/2 mouse port, with just a keyboard port being provided. 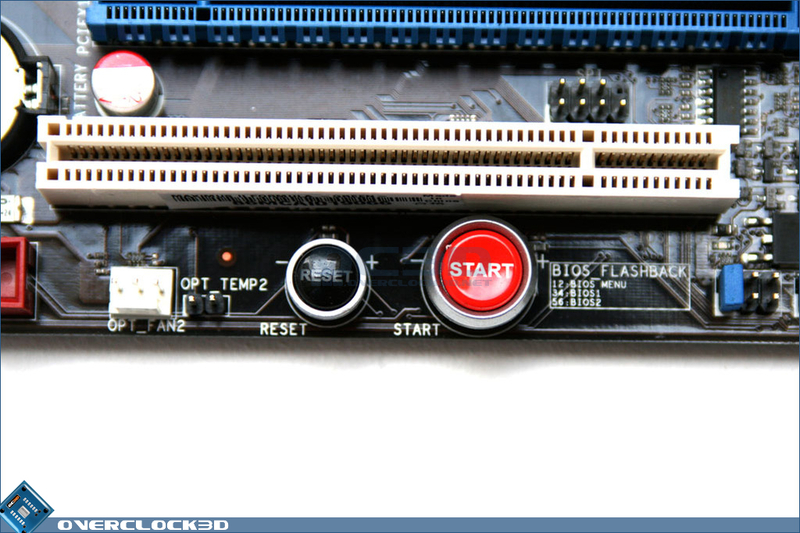 There is also a CMOS reset button, should you ever need to reset the BIOS (which is unlikely given the onboard features). 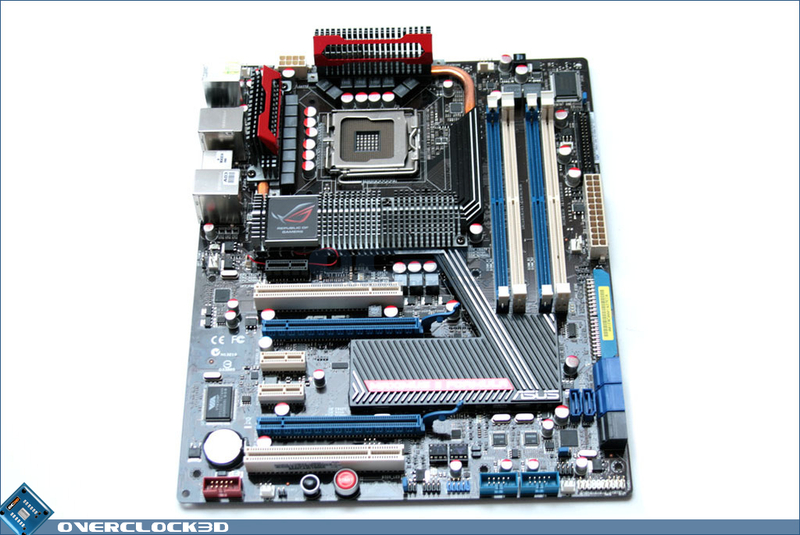 The CPU/Mosfet area, despite being cowled in heat sinks, is surprisingly spacious and we had no trouble fitting a Thermalright Ultra Extreme to the board. 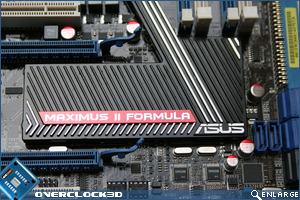 We see here that the Maximus, like its little brother the P5Q Deluxe, has a 16 phase power design which bodes well as the P5Q was a very high performer in recent tests - 16-Phase PWM for the CPU, 3-Phase for the Northbridge and 2-Phase for the DDR2 slots complete the power delivery for the Maximus II Formula. 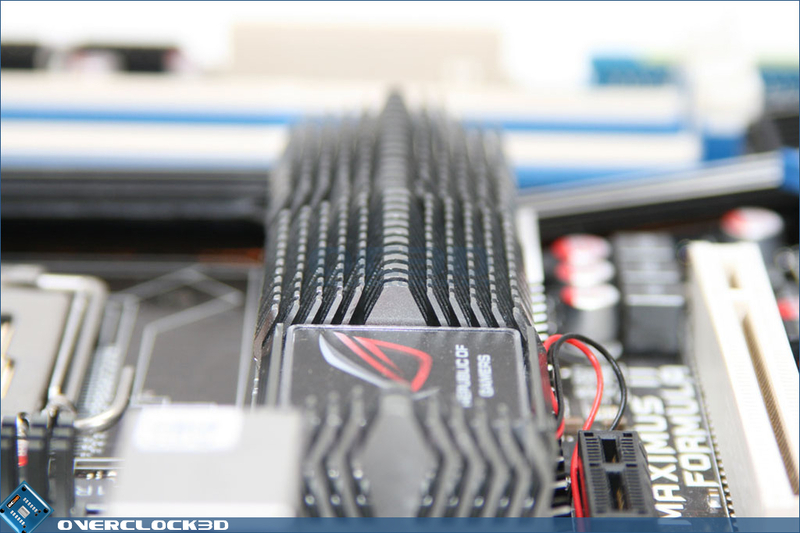 I am not usually a fan of heat sinks having labels and flashy designs on them; after all, they are there to cool and sticking things on them is only going to hinder the cooling performance. However, with the Maximus II I must say the red shielding, while preventing grazed knuckles, looks rather good and matches the board's looks perfectly. 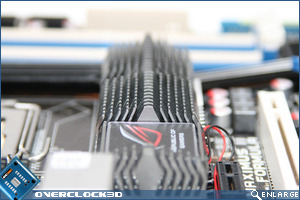 Asus have recently introduced a new heat sink design called 'pin-fin', which features slightly curved pins on the heat sinks that Asus claim is more efficient at dissipating heat than perpendicular designs. 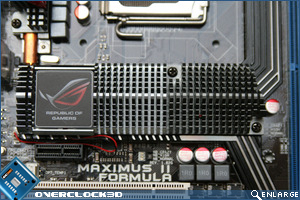 As well as the 'pin-fin' design, Asus have added the obligatory ROG emblem that lights up when the board is powered on. 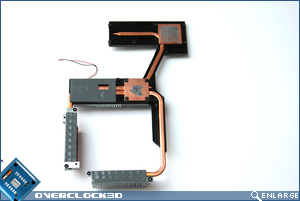 The Northbridge heatsink has a removeable section which can be removed to add your own cooling solution. 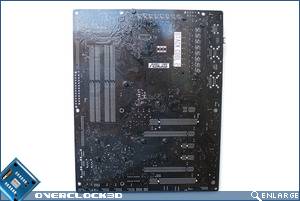 The actual usefullness of this depends on your point of view but I would recommend removing the whole heatsink assembly as just removing the top of the heatsink would have very little effect due to a copper 'sandwich' being created with 2 lots of TIM. 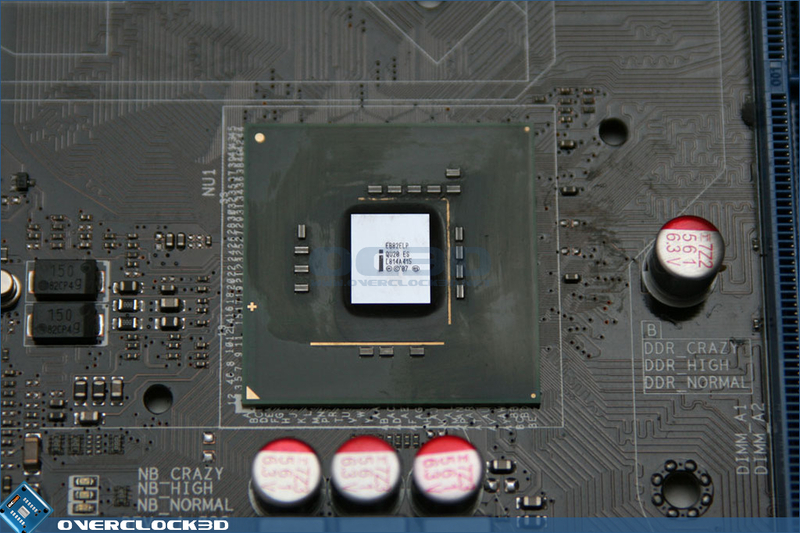 To the right of the CPU area and covering the southbridge we see a different heat sink that is more akin to a ribbed plate style than the usual fin variety. 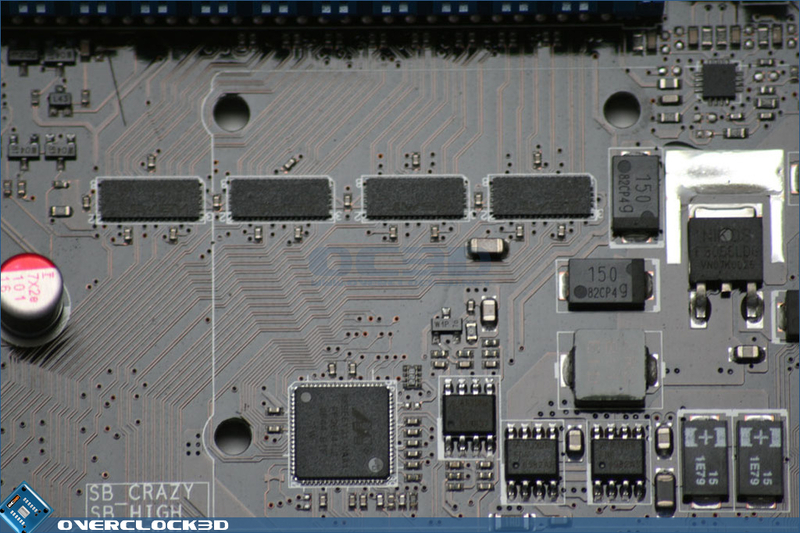 When I first caught sight of this board back, I suspected that the southbridge heat sink was extended to cover a Crosslinx chip as used in the Blitz series of boards, but this is not the case. 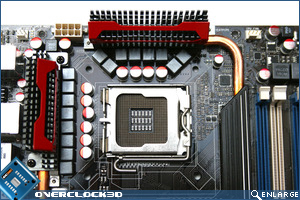 The whole heat sink assembly is connected via a full copper heat pipe, providing optimum cooling to all the areas concerned. 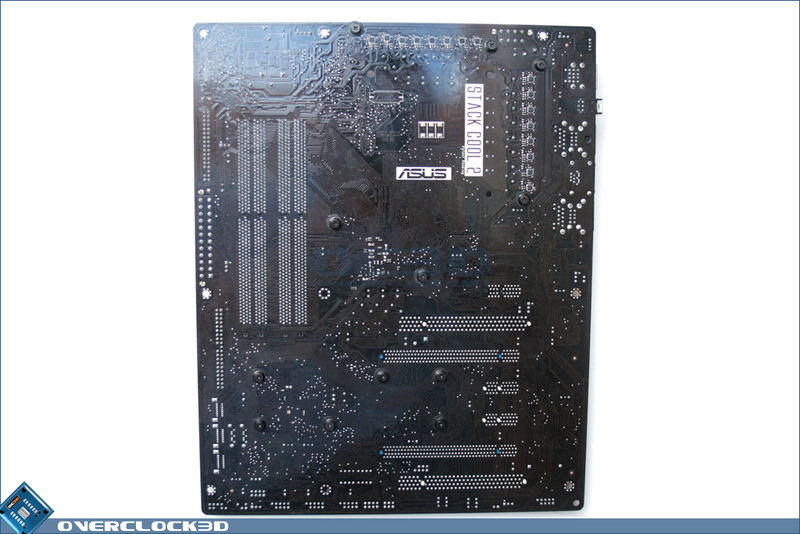 Below right we see the onboard switches getting a revamp, which suit the board quite well. 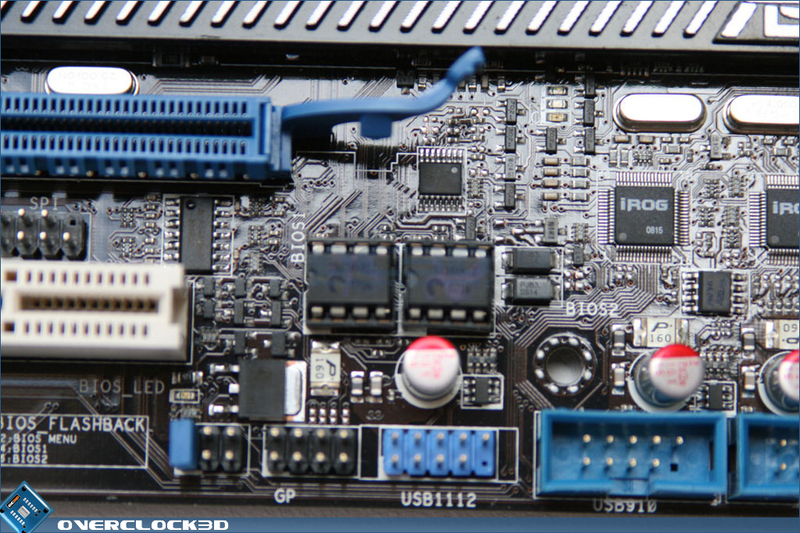 Dual BIOS chips are not something new, but recently motherboard manufacturers have omitted one of the chips in favour of software-based backups. Asus appear to have seen the error of their ways (anybody who has used Windows to flash an Asus board will tell tales of woe on that subject!). 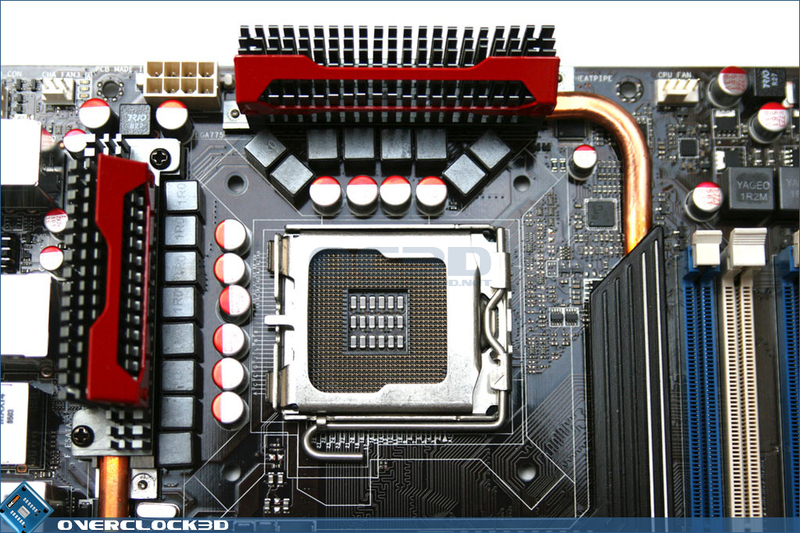 They have now included 2 BIOS chips on the board, and not only that but they have also opted not to permanently solder them to the board, making BIOS flashing a lot more hassle-free should the BIOS flash go wrong. 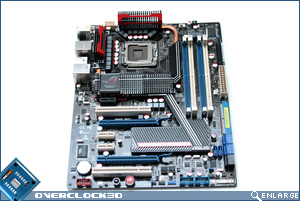 Removing the heat sink assembly was a very simple affair once all the screws were removed; it almost just fell off into my hands - testament to Asus listening to feedback regarding the 'cement' they have used previously to affix the cooling components. The TIM is very similar in appearance to the very common Arctic Silver 5 and is not thick at all. 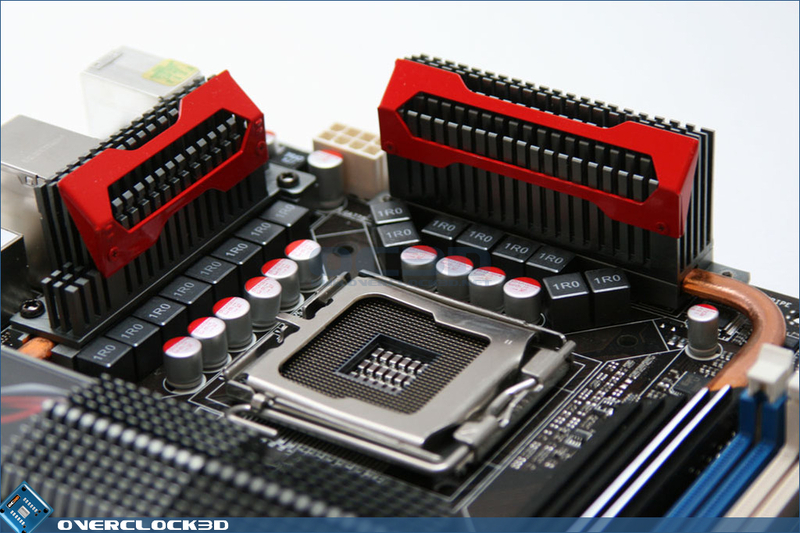 In fact, I could say that it is actually applied in an adequate amount and not the usual dollop found under most motherboards heat sinks. 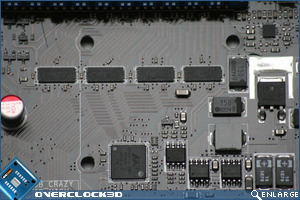 Here are the P45 Northbridge and ICH10R chips naked. 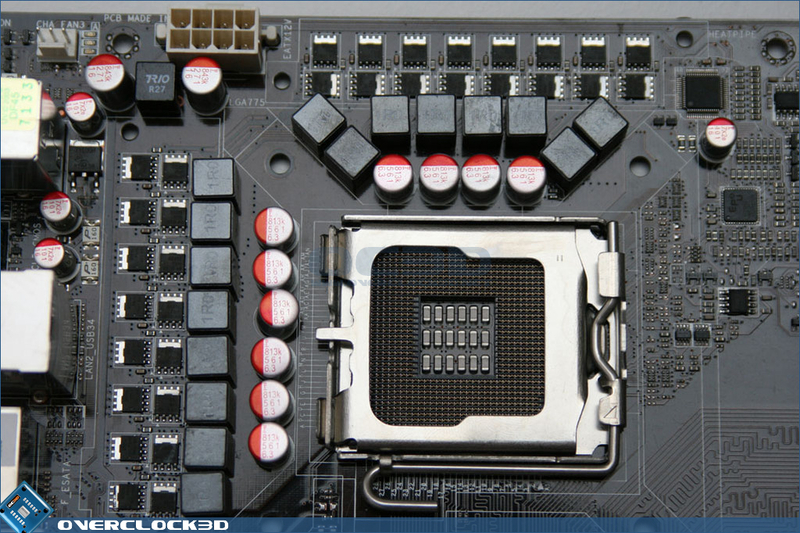 I would have preffered to have seen the P45 chip covered with a protective IHS as with x38/x48 rather than be totally bare as this would save a lot of heartache to those who have 'nibbled the northbridge' when affixing water blocks. 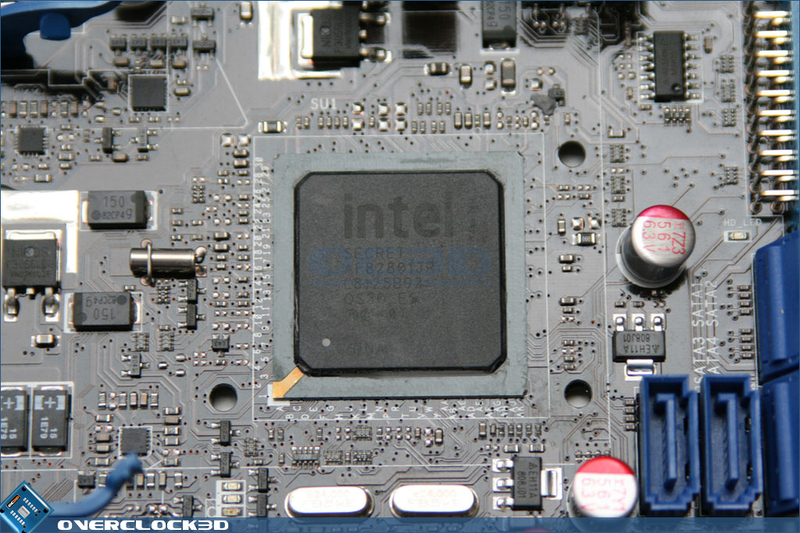 Down south we see the ICH10R chip, which IS a lot better protected. 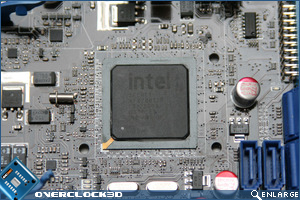 Note that the ICH10R chip has 'SECRET' written on it. I could tell you why that is but then it wouldn't be a secret, would it! The Mosfets are not attached to the heat sink via TIM but rather thermal tape, which has shown in the past not to be the best of materials used. It does, however, ensure that all the Mosfets receive some form of contact to the heat sink so the cooling properties are adequate but not the best. Lower right we ask what is under that huge heat sink covering the southbridge. This had me puzzled too as I thought it might be some form of the Crosslinx chip used in the Blitz series, but it appears it is nothing more than voltage regulating chips. Tis very very nice indeed. I really like the look of it. Rich, your OC tests - is the 3.9 jiggahurtz stable or just a screenie? 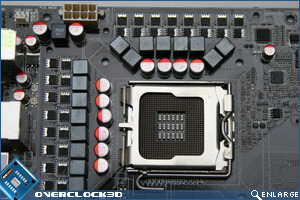 Also, how does that compare to other mobos you've had the chip on? Prime95 was run for overnight (8 hours) aswell as a 1hr hour OCCT run - not exactly proof of 24/7 stability but it's good enough imo. 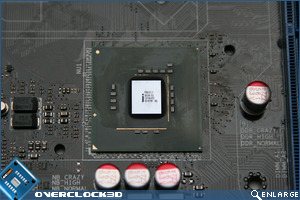 This is compared against similar results with the MSI and P5Q deluxe. 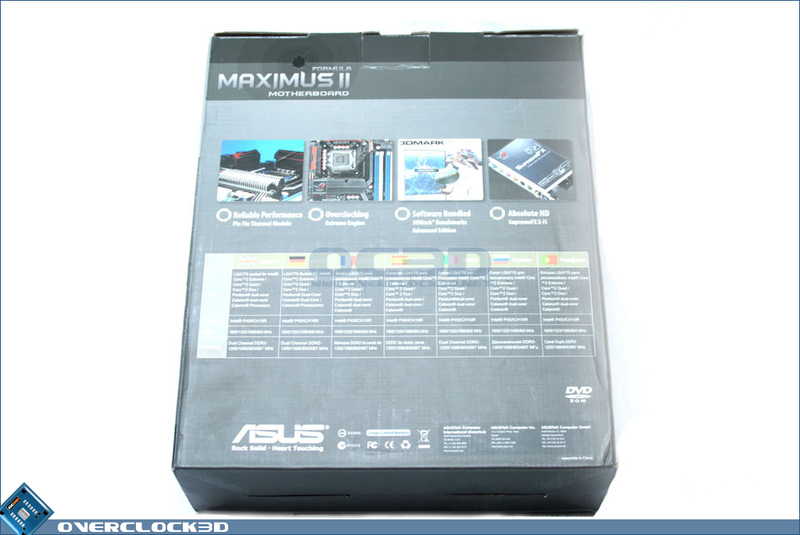 I rated the Maximus higher as, along with the ridiculous amount of BIOS tweaks available with more time and a more mature BIOS it is my belief the Maximus can at least equal the P5Q, not only that but gaming wise the maximus is already ahead of the P5Q albeit not by much. 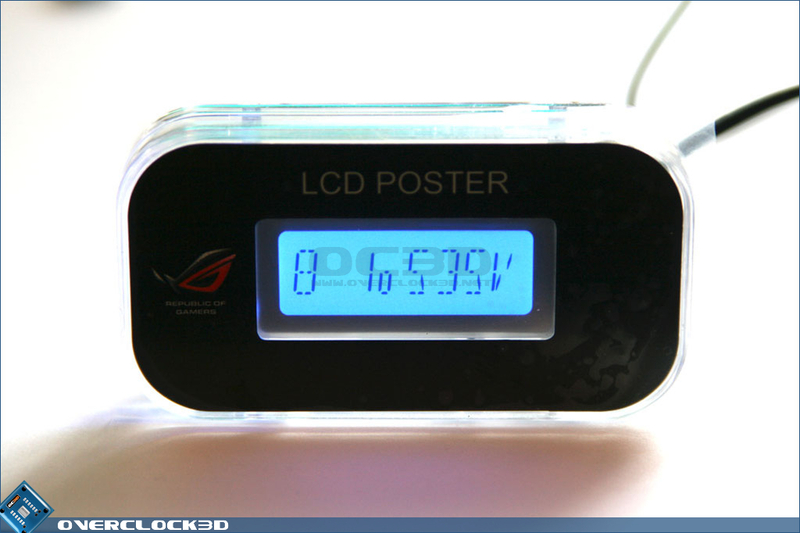 Also overclocking on air, as I'm sure you are aware, can be heavily influenced by ambient air temps which due to the recent hot weather is limiting the possibilities. 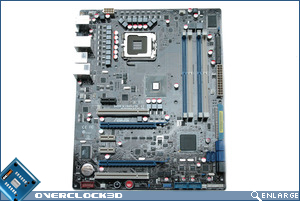 Using phase change is not realy an option as it isn't indicative of the 'average' user and wouldn't give a fair representation of the possibilities of the motherboard. 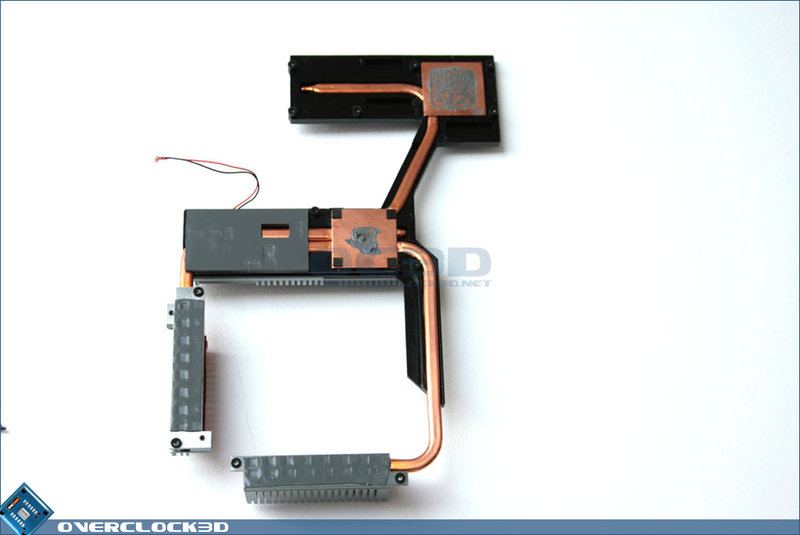 One thing that was in the press release, but I didnt see demonstrated, was the removable part of heatpipe cooling on the NB?